One of my regular readers shared some designs with me over the weekend. Tracy’s idea is to design a small lightweight habitable module that slides onto a common flatbed trailer. The entire structure would be built on top of skids tall enough to clear a trailer’s wheels so that the width of the house can be built out to the full legal road limit. In many states in America this is 8’6″ (102″). I have been reading your posts for quite sometime with enthusiasm. Tiny Houses on trailers is a fascinating subject and one that I wish I had known about when living on the Texas Coast. I have been pondering and idea for a small travel trailer type home for a while that will utilize a store bought utility trailer. It is made like a module that could be removed to use the trailer for it’s intended purpose, turned around and reloaded if an RV park had hookups on the opposing side. It would have standard RV hookups for water, sewer, and electricity and optional holding tanks would be mounted under the house in the spaces between the skids. These skids would allow full width of 102″ or whatever the State requirements are where the builder lives. Texas is 102″. You can still have standing headroom without going over the max height but not really have a “Sleeping Loft”. You could make a storage area in the loft if needed. This design would have a thin wall with a 1/2″ ply sandwich with 3/4″ lumbar frame work and 1/8″ panel inside. Dow Corning pink foam board would be used in the open spaces of the framework for insulation. It’s thin walled to keep the weight down for towing with a small sport utility or van. I don’t mind sharing the picture now. I’m still working on the frame work files and such. Part of my thought is maybe having something where everyone who wants to, can add to the design. We’re all in this together. I couldn’t have said it better myself. 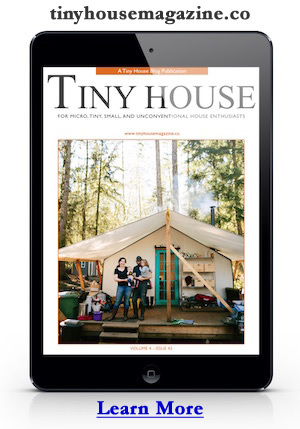 In fact one of the main reasons I blog about tiny houses is that I think that people like you and me can solve our own housing challenges when we share our ideas and knowledge. I really truly believe we’re stronger together. Thank you Tracy! I’m really looking forward to seeing how this concept progresses. If anyone has any suggestions or additional ideas please post a comment. This entry was posted in Design Concepts and tagged module, skid, tiny house, Tracy, trailer. I’ve been thinking of a similar tiny house project, but in my case the house could be shifted to a buoyant base for use as a houseboat. I toyed with the idea of being able to move to a “Barge” base for making a Houseboat out of it. Still in the idea stage there though I have designed some small houseboats for myself before. Maybe I can submit the Houseboat to Michael and see what people think. This skid design is meant to be versatile so it’s really just a limit of the imagination. What a good idea !!! I want the same concept to have a little garage to stow my motorcycle. When it’s time, I take my toy to a campsite where I can enjoy my bike, and have a much better place to sleep than a tent. Please go on with your great idea !!! Greetings, Francisco from Chile.